Babe Ruth's last will and testament has finally made its way back to the NYC courthouse it was stolen from. A little over two years ago, Haulsofshame.com and The New York Post reported that the last will and testament of the “Sultan of Swat” was missing from the New York City courthouse where it was originally filed in 1948. But thanks to a court action brought by the New York State Attorney General’s office against hobby veteran Mark Lewis, the last document ever signed by Babe Ruth is back where it belongs. Surrogate’s Court archivist, Kim Sulik, recently confirmed that the document had been returned to the Court, however, it was only this week that Haulsofshame.com obtained a copy of the Court’s decision in the State of New York vs. Mark Lewis, which was filed earlier this year at the New York County Clerk’s office. The original action was filed against Lewis by Governor Andrew M. Cuomo when he was still Attorney General. Judge Marilyn Sugarman, appointed special referee in the case, said in her decision, “Although no evidence was presented with respect to whether, in fact, it was Mr. Lewis who removed the last will and testament of George Herman “Babe” Ruth, again, there was sufficient evidence that it is currently in his possession.” Lewis was ordered to return the stolen document within thirty days and complied with the Court’s order. The theft of the will dates back to the 1990s as part of a string of heists of rare Baseball Hall of Famer signatures found on a myriad of wills and legal documents. An investigation of those thefts led to the conviction of a Boston Court officer named Joe Schnabel who admitted to investigators lifting and peddling the wills of baseball legends including “Old Hoss” Radbourn, George Wright, Hugh Duffy, Tommy Connolly, Tom Yawkey, Ned Hanlon and the now recovered will of Babe Ruth. Schnabel pleaded guilty to only two counts of larceny and was sentenced to one year of probation with a fine of $5,000. Despite that conviction in 1999, still missing from court house files all over the country are the wills of other Hall of Famers including Jimmy Collins, Joe McCarthy, Jesse Burkett, Jack Chesbro, James O’Rourke, Roger Connor, John J. Evers, Tommy McCarthy, Tim Keefe, Harry Wright and even Jackie Robinson. When he was interviewed two years ago by Haulsofshame.com, Mark Lewis said, “Thirteen years ago I bought Jackie Robinson’s will at the National Sports Collectors convention for $500.” The Robinson will has been missing from a Stamford, CT, courthouse for at least sixteen years. When asked, Lewis couldn’t recall the name of the person that he purchased the stolen Robinson will from. Lewis did, however, claim to remember who he purchased the 1948 Ruth will from for $30,000. “I bought it from Babe Ruth’s lawyer’s grandson, who was named Lowenstein,” said Lewis. This shaky Babe Ruth signature is found on his last will and testament that has been returned to the NY Surrogates Court. Mark Lewis (left), founded Card Prices Update in the 1980s and battled Dr. James Beckett (right) and his attorney, Herman Kaufman (center) in hobby-related litigation that was decided by the same New York Supreme Court that ruled on Babe Ruth's will. 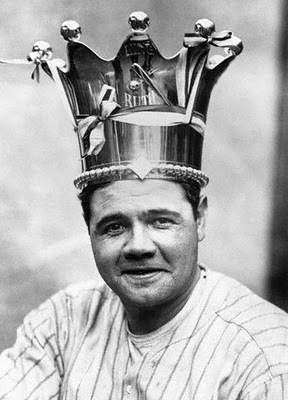 Despite Lewis’ claims, Detective Steven Blair of the Boston Police Department confirmed last year that the will of Babe Ruth was on a 1999 list of seventeen documents that the will-thief, Joe Schnabel, admitted to taking. Original stolen wills and fragments cut from those original documents have surfaced in the hobby for the past fifteen years. (Top) A 1999 SCD article about the missing Radbourn will. (Bottom) The signature of "Old Hoss" Radbourn from his last will and testament. MastroNet offered the stolen will of Ned Hanlon in 2000 and dealer and PSA authenticator, Kevin Keating, offered for sale a Hanlon signature cut from legal documents associated with his will. Keating also recently offered for $6,500 a document signed by George Wright that was removed from the probate file of his wife Abby Wright. Joe Schnabel had already admitted to stealing the wills and accompanying probate documents of Abby and George Wright, which were discovered being sold by Lelands auction house. Boston title examiner Michael Bowlby was the first person to determine the wills were stolen in October of 1998, and notified the Register of Deeds at the Suffolk County Probate Court, Richard Iannella. An FBI probe ensued and sources indicate that investigators also questioned collector Barry Halper to see if he knew of any other wills in the marketplace. Halper denied having knowledge of any stolen wills but it is clear that he lied to investigators. In a 1982 interview with Sports Illustrated, Halper revealed that he owned the last will and testament of Hall of Famer Tommy McCarthy, which was stolen from the probate court in Boston and still in his possession at the time he was questioned. One of the most valuable wills sold by Schnabel through his fence, New Jersey memorabilia dealer, Jack Heir, was an 1895 document signed by Boston pitcher “Old Hoss” Radbourn, which changed hands for close to $20,000. That document has also been recovered and is currently safe and sound at the McClean County Probate Court in Illinois. 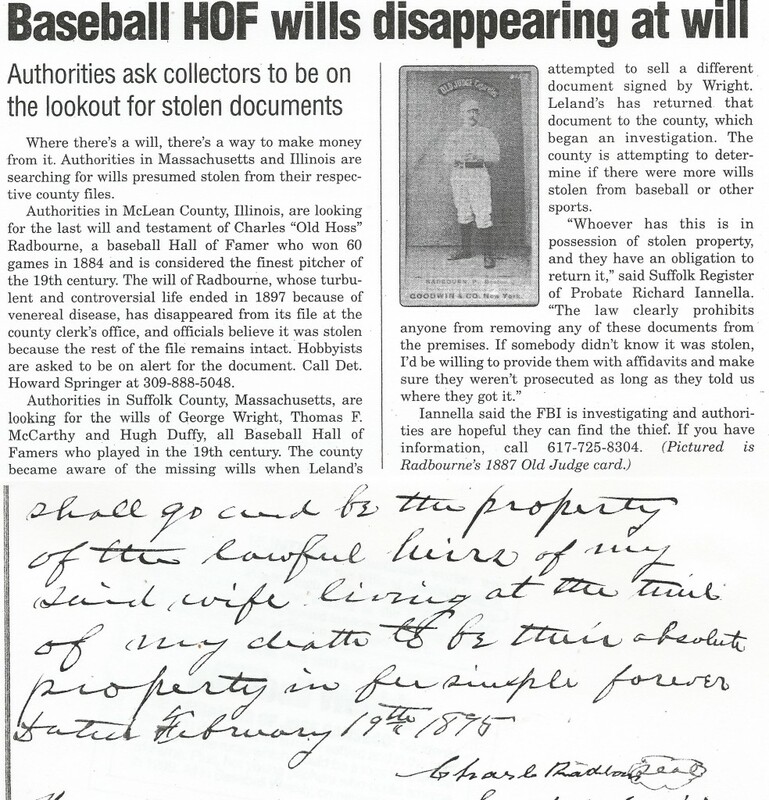 Another important document constituting the codicil of the last will and testament of the “Father of Professional Baseball,” Harry Wright, was stolen from the Philadelphia probate court and in 1998 was sold by Hunt Auctions of Exton, PA. Hunt placed a pre-auction estimate on the document at “$6,000-$8,000.” The Wright will is still missing as are thousands of other Wright related documents stolen from the New York Public Library and the focus of another FBI investigation. The recent court documents filed with the New York County clerk indicate that Mark Lewis did not appear in court to contest New York State’s claim that the Babe Ruth will was the property of the Surrogate’s Court. One of the other stolen treasures that is still missing from the court house files is the Babe’s 1925 separation from his first wife. That document was also owned by Barry Halper, but it appears to have vanished sometime before the 1999 Sotheby’s sale of the deceased Yankee limited partner’s collection. Although Mark Lewis has also admitted to once owning the stolen will of Jackie Robinson, there have been no formal attempts made to recover the will of the Brooklyn Dodger who broke baseball’s color barrier. Glad to hear it is back where it was stolen from and those thieving bastards were nailed.Once again, Sherlock did his job. Just curious – how does Peter Nash know that the will under discussion here was “the last document ever signed by Babe Ruth”? Most people make out and sign their wills well before they actually die, so I’m wondering how he reached this conclusion. Shaky signature nothwithstanding, what evidence is there that the will is indeed the “last document ever signed by Babe Ruth”? The will was signed on August 9th 1948 and Ruth was listed in critical condition by the 11th, according to family recollections. He passed away on August 16th. I’m not aware of any other document existing that he signed after August 9th. I’m sure he could have, but nothing has ever surfaced and considering his condition it is unlikely he executed any other type of document. His daughter did recall him signing some small cards for kids after the 9th, but that has never been confirmed. I’ve never heard of any of those cards surfacing that he was said to have signed. The majority of autographs existing for Ruth in 1948 were secretarial signatures. If you know of any others please send them along. Thanks. I should only wish I knew of others… Thanks for the clarification, Peter. Perfect answer Peter, as you is the man with all the knowledge and have put many on the hot seat with it all and exposing the culprits,keep up the good work. The discovery that the wills and other probate documents were missing from Suffolk County in Massachusetts was purely serendipitous. I had never registered for or bid in any auctions However, in October, 1998 I received a copy of the Leland’s Auction catalogue for their upcoming auction. I was thumbing through it and on one of the first pages I saw the George Wright document listed. Having worked at the court houses all over the state and quite familiar with procedure I knew it was stolen. Massachusetts Courts do not de-accession their probate documents ie. throw them out. Mr. Ianella travelled to the Leland’s offices with a county attorney to retrieve the document. They were reluctant to surrender it and also claimed they paid cash for it at a show. Mr. Ianella then contacted the FBI. It was their involvement that ‘convinced’ Josh Evans et al. that they needed to surrender the document and provide the information regarding its purchase. After the initial discovery I checked other courthouses in Massachusetts to see if any other wills were missing. It did not appear that Jesse Burkett had a will when he died in Worcester. It did appear that the will of Jack Chesbro was stolen from the Franklin County probate court. The FBI was not terribly thorough in this case and got upset when I reported this to one of the newspapers and not them. They were not paying me and I had no vested interest in telling them. One interesting aspect is that Schnabel tried to implicate me as I knew him as a collector and from the courthouse. I was interviewed by the FBI and they investigated me. Nothing came of that though they were shaken when I told them that if I had stolen them I would have known how to do it so that no suspicion would be raised. I will leave it at this as it is a long story. I continue to live by the credo: “Integrity is what you do when no one is looking.” Clarification to the story, Mr. Ianella was and still is the Register of Probate, not Deeds for Suffolk County. I respect the Honorable Marilyn Sugarman’s ruling and final decision in the case of Babe Ruth’s will being property still belonging to the State of New York. Peter great stuff! As to Ruth’s missing things , Josh E visit to Barry H home and also Jackie R’s ,Stanford files. As I mentioned to you we’ve been searching for records around the missing 8′ 1934 Ruth statue by Rueben Nakian since 1987, was last seen in Ruth’s hometown in 1935 and was on display at the BMA then. Even they lost all records of it being there. Paul Nakian and I updated them with a picture of it there with two little boys standing next to it in 2009. Paul visited Barry in the 80’s, he knew nothing about it, The Hof had no records of it. Rueben’s wife even sold Jackie R his first home in Stanford. Such Great History can just disappear at the hands of a few for the Mighty $$$! I will be e-mailing you more especially going back to 1999 and are dealings as to sharing History and important documents. We’ve never purchased anything from these Auction’s nor ever will.